Woohoo! Footy is back so version 3 of My Team begins as the NAB Challenge gives us plenty more to think about. Woohoo! 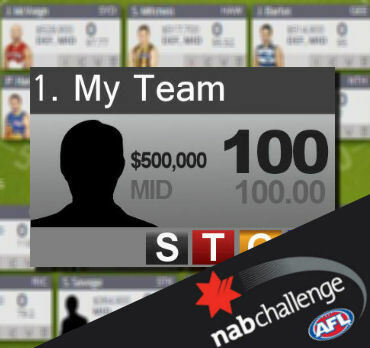 The NAB Challenge is here and our fantasy study now ramps up. Let’s hit up version 3.0 of the My Team post. The others have been going gangbusters, so pump out your teams and thoughts in the comments. Thoughts? please give some feedback. Forget Bombers players and Brodie Smith. Replace with Simpson and a mid pricer and upgrade your mids, at least one premo short. Upgrade Wines. Very strong midfield. If I were you I’d like to utilise some of the rookie mids eg. Freeman, Woodward, Anderson, Amon, Newton etc. because as we’ve seen from the NAB games, NVB and Rich are locked but they’re output may not be the best. Can someone sell Brodie smith to me? 2 of Taylor Hunt, Brad Sheppard and Geary?